You are currently browsing the daily archive for November 25, 2013. Ever since I was a little kid (who was obsessed with Hello Kitty & ALL THINGS Sanrio), I’ve been hoarding collecting pens. It started with my habit of “keeping the last one before I use it all up”. Just like I do with my letter sets, I keep the last sheet of paper & envelope as a way to show a timeline of all the sets I’ve had over the years, & also as a keepsake to look back on all my old letter sets. As for my pens, I’d use the pens until they were almost out of ink, then I’d save the pen & not use it again for the same reasons. I’ve pretty much packed away my old stationery sets & sent them off to my storage closet for safe-keeping, but I still have a huge craft box (see previous entries for a visual reference) of all the pens I currently use. Lately, I’ve been extremely addicted to the Zebra Sarasa Push Clip Gel Ink pens. I’ve been collecting all of the colors little-by-little, & I believe I have amassed a collection of approximately 20 pens or so. I’ve been mainly collecting the plain colored pens & not the metallic pens. I’m not a fan of metallic gel ink pens as I feel they tend to smudge easily. My favorite pen tip thickness is 0.5mm; it’s just the right amount of thickness that I like for writing, & the tip is not too thin/sharp to tear the paper. While I was on my trip to Asia, I kind of went a little crazy with stocking up on stationery again. 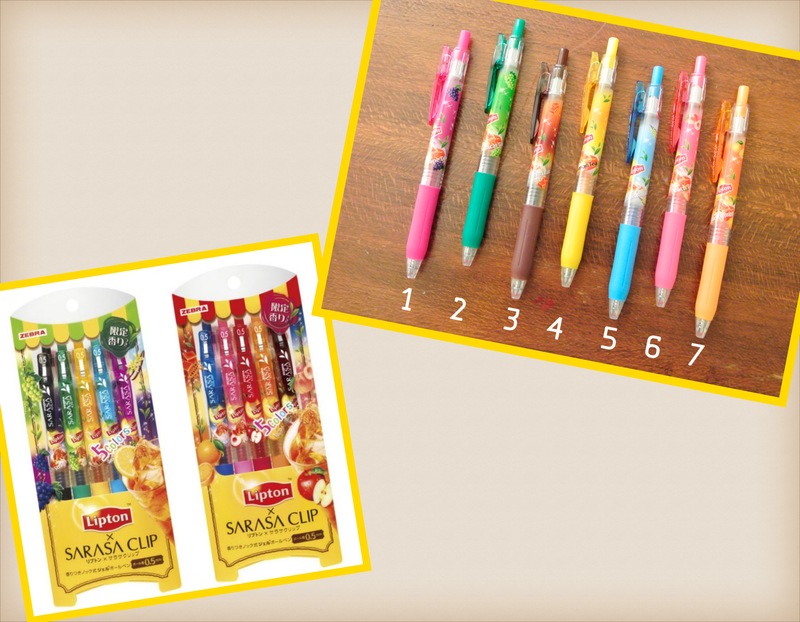 I recently saw a new collection of scented pens by Zebra, which was a collaboration with Lipton tea. The pens all have a different fruit tea scent. I normally don’t care for scented ink pens, but… 1. these were part of a limited edition set, 2. the scents smelled nice, 3. I love Lipton tea, & 4. I just couldn’t pass them up! These are the pens I picked up. Unfortunately I wasn’t able to get the packaged sets, so I am missing a few of the colors to make a complete collection. 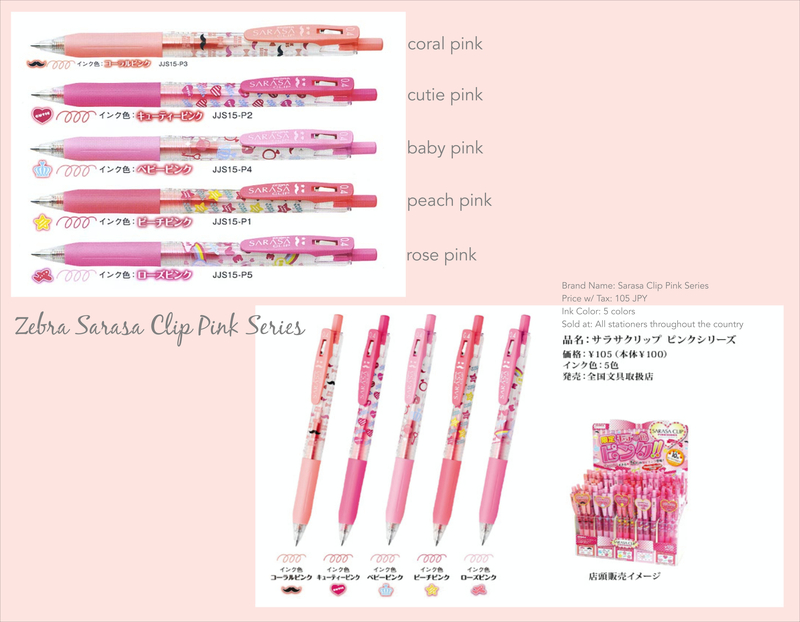 I also picked up one pink pen from the limited edition Pink Series. There are a total of 5 various ‘pink’ colors in this series. I only chose the coral pink “mustache” color. 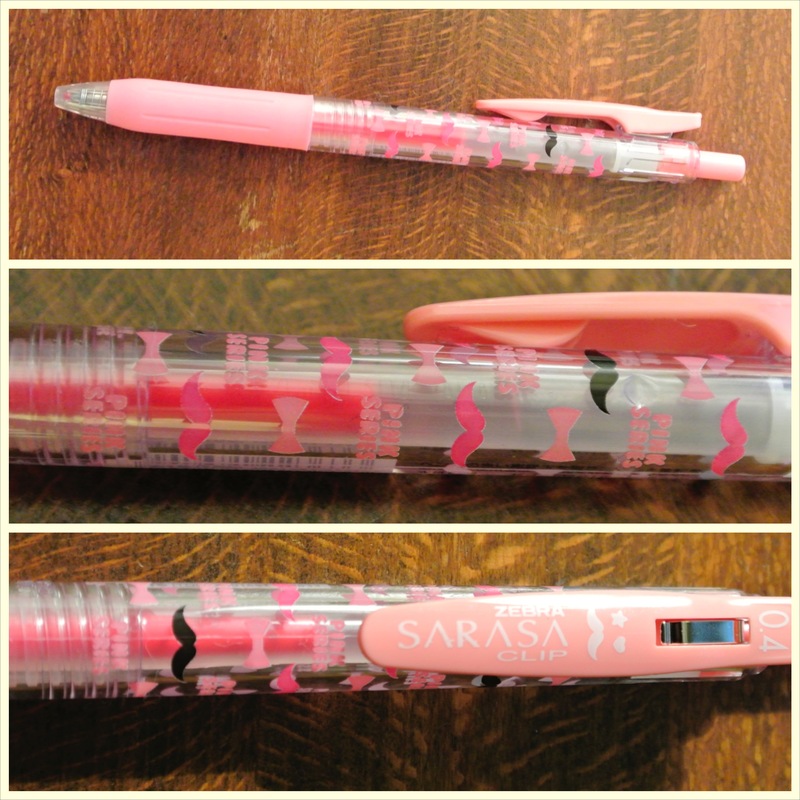 Yep, I guess you could say that I’m really bananas for this Sarasa Gel Ink clip pen. I might need help for my pen addiction. Hellllll~p!